To find the wheelchair ramp, open Furniture mode and search for "ramp", or follow the instructions below. You can resize the ramp using its Properties, which appear on the right (when it is selected in your floor plan). The ramp also has the Replace Materials feature that allows you to edit the color and texture of the ramp. To edit the Floor Height, open Walls mode, and then click on the area whose height you want to adjust (it will turn blue). In our example below, we clicked the Outdoor Space, then Advanced Properties. Drag the ramp onto the floor plan and into position, using the curved blue arrow to rotate it if needed. 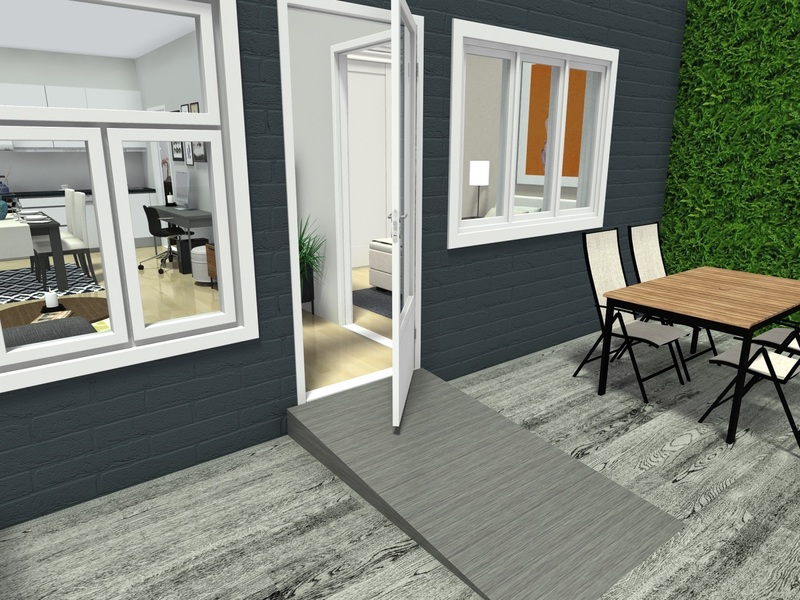 The ramp height needs to match the difference in height between the indoor space and the outdoor space (this would be the same as the Floor Height in this case). Type the number in the Height field on the right. Take a quick snapshot to view your ramp in 3D and then make any additional changes.